The Bet Bet Reef Gold Puddling Site is an unusual example of a puddling machine. Instead of the usual timber slats, the puddling trench is retained by corrugated iron and stone, and has a concrete floor. The puddling machine most probably operated in the twentieth century. The puddling machine is an excellent and late example of the puddling technology developed in Victoria from 1854 in response to the need to process enormous amounts of clay soil which needed to be broken up to get at the gold. Horses were used to drag harrows around a circular ditch in which the soil and water were mixed. The Bet Bet Reef Gold Puddling Site is of historical, archaeological and scientific importance to the State of Victoria. 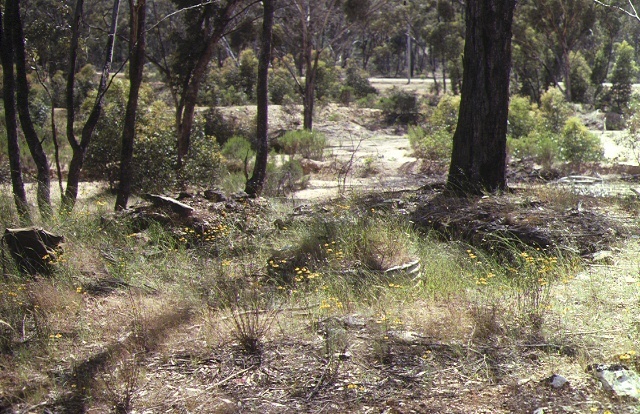 The Bet Bet Reef Gold Puddling Site is historically and scientifically important as a characteristic and well preserved example of a site associated with the earliest forms of gold mining which, from 1851, played a pivotal role in the development of Victoria. Puddling machine technology is particularly important in the history of Victorian gold mining as the only technology or method developed entirely on Victorian goldfields. The Bet Bet Reef Gold Puddling Site is archaeologically important for its potential to yield artefacts which will be able to provide significant information about the cultural history of gold mining and the gold seekers themselves. Bet Bet Reef Gold Puddling Site, Junction of Maryborough and Bromley Roads, Dunolly, Central GoldfieldsShire Council. 1. All of the land including one puddler and other gold mining relics within a 100 metre radius of the point with Australian Map Grid co-ordinates E447 N126 on 1:100,000 map sheet number 7624 Dunolly.